Does Jones Family Care Home, Inc offer the following services? 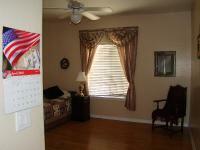 beautiful spacious, 8 bedrooms/ 4 bathroom care home in mesa, az. Licensed for 10, loving care in a family atmosphere. All levels of care offered, medication reminders, housekeeping, laundry service, home cooked meals offered, activities and exercise sessions, hospice services, drs. That make house calls, 24/7 awake care. Call or drop in for a tour. I am very lucky to have found this place for my dad. They took care of my father with love and care all the way through his last days. They dressed him when he wasn't able do it himself. Help him to the bathroom and cleaned him. The owner has a heart so big it shines with compassion for all the people living there and there families , also for the people that work for her. I am so thankful! July 26, 2013 I have a friend staying at the Jones Family Care Home while getting radiation and chemo treatments for throat cancer. I had been there twice to visit him. Seems like a nice place, high ceilings, friendly staff. However I had a surprising and bad experience at the end of my 2nd visit. There is a gentleman a little ways down the hall from my friend's room who often sings. Not loud or obnoxious but he sings. My friend says that it does not bother him but that he will occasionally shut his door. On the way out, I commented as a weak attempt at humor, to the two staff at the front desk: "tell the man who sings to not quit his day job". The twenty-something staff member looked at me, obviously not knowing what I was talking about. I said as an attempt to explain what I meant; "he won't make a living from his singing". The other staff member standing there was a 40ish woman, very friendly and bubbly. After I left, that evening I received a text from my friend's son, that read: "Craig. I'm not sure what happened earlier today. Due to comments you apparently made about other residents in the home, the staff at the Jones Family Care Home have requested that you do not contact them or show up there ever again". I contacted the Jones Family home through their website, explaining that my comment was a weak attempt at humor, and that I did not mean to insult anyone, and that I would like to continue to visit my friend during this rough period in his life. I haven't heard back. So be extra careful what you say while visiting this home. I am very disappointed that the 40ish staff woman didn't have the maturity to recognize my comment as a dumb joke by an aging man and choose to blow it off. She heard my comment first hand.